This paper examines the Wagner’s Law for a sample of East Asian countries (China, Hong Kong, Japan and South Korea) by utilizing the structural break methods viz., Gregory and Hansen (J Econom 70:99–126, 1996a; Oxf Bull Econ Stat 58:555–559, 1996b), Carrion-i-Silvestre and Sanso (Oxf Bull Econ Stat 68:623–646, 2006) and Bai and Perron (Econometrica 66:47–78, 1998; J Appl Econom 18:1–22, 2003). 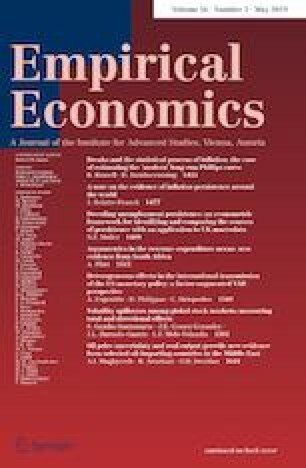 We find that there exists weak cointegrating relationship between the log of nominal public expenditure as a share of nominal GDP to the log of real per capita GDP. However, we find support for the Wagner’s Law when the relationship is extended to include a measure of the population structure—the dependency ratio. Our findings support the explanations suggested by Durevall and Henrekson (J Public Econ 95(7–8):708–722, 2011). All applicable international, national and/or institutional guidelines for the care and use of animals were followed. Not applicable. All procedures performed in studies involving human participants were in accordance with the ethical standards of the institutional and/or national research committee and with the 1964 Helsinki declaration and its later amendments or comparable ethical standards. Not applicable. This article does not contain any studies with human participants performed by any of the authors.